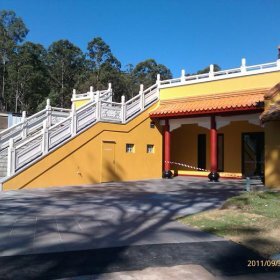 The project consisted of constructing a new administration building on the northern side of the existing Temple buildings currently occupied by the International Buddhist Association of Queensland, located in the Brisbane suburb of Priestdale. 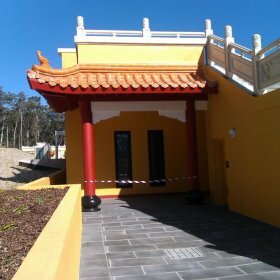 A new entry structure, the Mountain Gate was also constructed to the south of the existing buildings, directly off Underwood Road. Lambert & Rehbein were engaged to provide structural and civil engineering services from conceptual design stage to project completion. The superstructure to the administration building consisted of a suspended reinforced concrete roof (Podium) slab supported on a series of reinforced block walls and concrete columns. The podium level is accessed by a flight of concrete stairs on both the east and west sides. Footings were generally high level strip and pads with a series of bored piers located along the north elevation where an existing stormwater pipe was located adjacent to the building. Concrete slab on ground was used throughout the ground floor. 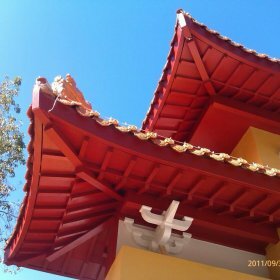 The Mountain Gate structure used a steel frame on reinforced block walls to support the Chinese tiled roof.